I saw two very different movies on Saturday, but both were about physics. Well, sort of. Physics and fiction don’t blend together unless you can work in suspense, romance, tragedy, horrible diseases, and special effects. Although one movie is a big, expensive Hollywood sci-fi blockbuster, and the other a British Indiewood biopic, their titles are almost interchangeable. 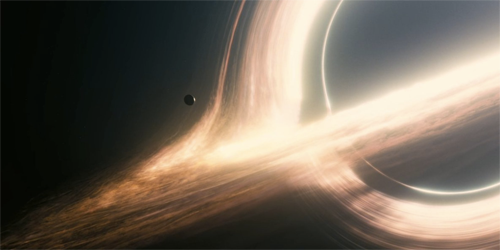 Christopher Nolan’s space epic tries hard to be another 2001: A Space Odyssey–plot points, individual shots, and at least one character comes straight from Kubrick’s work. But whereas Kubrick explained very little, Nolan fills his picture with badly-written expository dialog. And despite all that, the movie still confuses audiences. And when it’s not confusing, it’s often dumb. 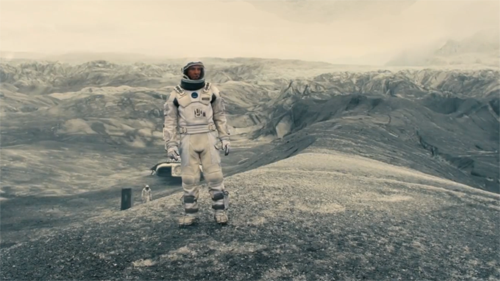 Not that Interstellar is a complete loss. It’s visually stunning, and deserves to be seen on the biggest screen available. It’s often exciting and suspenseful. And for most of its runtime, it carries a strong sense of doom for both the main characters and the human race as a whole. It’s set in a near future where the few remaining people are facing eventual starvation (oddly, there’s no violence). NASA sends four humans (you guessed it; two white men, one white woman, and a black man–guess who dies) through a wormhole to find a habitable planet. 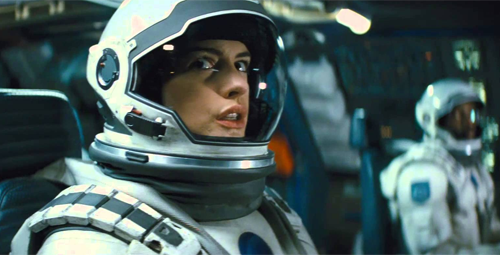 Despite the holes in the science and the plot, and despite a female astronaut (Anne Hathaway) who behaves in an offensively stereotypically female way, I still found the picture reasonably interesting and enjoyable. That is, until the interminable third act. In the last hour, everything slows down to a crawl, the story and scientific logic collapse into a black hole, and the whole thing makes no sense at all. It’s explained, but the explanation doesn’t hold up. I saw Interstellar in 70mm at Oakland’s Grand Lake Theater. I’ll write another post about the presentation. No one in this Stephen Hawking biopic blasts into space and dives into a wormhole, but the theories that suggest such things are possible play an important supporting role. Far more important roles are played by love, romance, and disabilities. The film concentrates on Hawking’s first marriage, to Jane Wilde (Felicity Jones). She proposes to Hawking (Eddie Redmayne) soon after he’s diagnosed with motor neuron disease, with doctors giving him about two years to live. They broke up 25 years later, and he’s still working 24 years after that. Like so many British pictures, Theory provides a showcase for great acting. Jones plays Jane from a young college girl to a middle-aged mother, still in love with her husband but frustrated with the responsibilities thrust upon her as her husband deteriorates. Other respected talents in the cast include David Thewlis and Emily Watson. But Redmayne has the big, showy role, and I’d be surprised if he doesn’t walk away with an Oscar next year. His Hawking doesn’t just age over the movie, he deteriorates. At first he’s just clumsy. Then his hands and feet don’t quite work properly. Slowly he becomes the Hawking we know, crumpled in his wheelchair, using a mouse-like device in his one good hand to communicate to the world via an electronic voice. Redmayne catches not only Hawking’s brilliance and his disability, but also his impish humor. I’m not quite ready to say this is the best performance of the year, but it’s certainly the most noticeable. 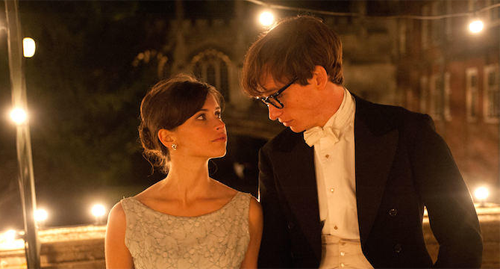 The Theory of Everything pushes no cinematic boundaries. If you’ve ever seen a 21st century British film set in the 20th century, you know exactly what you’re going to get. But that doesn’t make a bad film. In fact, it’s a very good one. It’s just not exceptional.